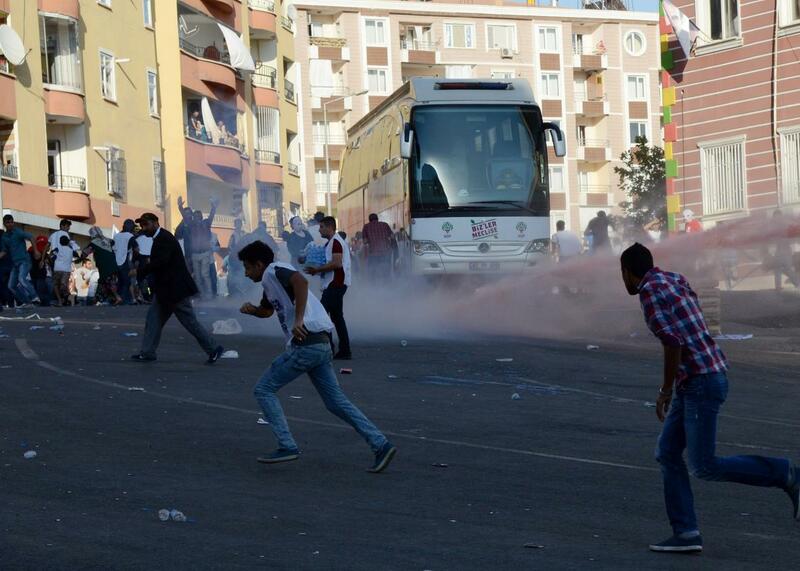 Riot police use water cannon to disperse protesters in Diyarbakir, Turkey, on Aug. 1, 2015. Two British journalists and an Iraqi fixer working for Vice News were charged today with “engaging in terror activity” on behalf of ISIS by a court in southeastern Turkey last week. Jake Hanrahan, Philip Pendlebury, and the fixer were arrested last Thursday while filming clashes between Turkish security forces and members of the Kurdish militant group PKK in the city of Diyarbakir, part of the government’s renewed crackdown against the banned group. They were initially charged with filming without government accreditation, but then “accused of supporting the so-called Islamic State (IS),” according to a Vice statement. They have now been taken to jail and are awaiting trial. The state’s crackdowns on the media have generally focused on domestic rather than foreign reporters, but even before the Vice arrests, there had been unsettling signs that was changing. Erdogan has accused the international media of fomenting unrest in Turkey, particularly surrounding the Kurdish conflict, and in April, Dutch reporter Frederike Geerdink, the only foreign journalist based in Diyarbakir, became the first foreign journalist to face trial in the country in more than a decade when she was accused of aiding the PKK. She was eventually acquitted, but the government can still appeal the case. The dubious charges against the Vice reporters come just a couple of days after an Egyptian court unexpectedly sentenced three Al Jazeera reporters to three years in prison for having broadcast “false news” about the country. The case had attracted international attention, and the men were widely expected to be exonerated or let off with time served. One additional way this trend is quite troubling: Egypt and Turkey both serve as home bases for many reporters covering not just those countries but the wider Middle East. Taken together, these cases are a disturbing sign that even the safe countries in the region aren’t so safe for foreign journalists anymore. Update, Sept. 1, 2015: This post has been updated and the name of the Iraqi fixer has been removed for his safety at Vice’s request.